A fight between Former Love & Hip Hop: Los Angeles star, Masika Kalysha and raper Fetty Wap ensued in Instagram and it got real dirty. 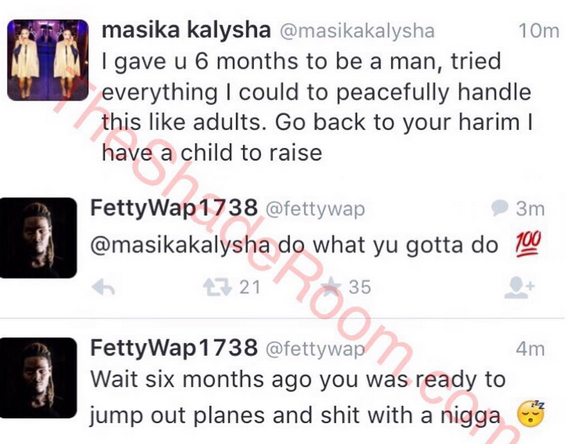 Masika who claims she’s pregnant for rapper Fetty Wap (he’s asking for a paternity test just to be safe) took to her instagram page yesterday to bash him, calling him a ‘dirty, triflin, hoodrat, lowlife dead beat f**k boy” He’s all these and she got pregnant by him? Anyway, Fetty fired back.